Captain of plane that landed in river: I'll return to work "as soon as I'm ready"
Sullenberger, crew recount Hudson River landing on "Larry King Live"
First officer: Everybody did their jobs, and "we had good fortune"
(CNN) -- Capt. 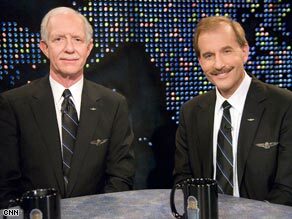 Chesley "Sully" Sullenberger says he'll take to the skies again -- as soon as he can shake Flight 1549 out of his head. Capt. Chesley "Sully" Sullenberger, left, and First Officer Jeffrey Skiles say they'll eventually return to work. "I'll be going back to work as soon as I'm ready," said Sullenberger, who along with First Officer Jeffrey Skiles safely guided US Airways Flight 1549 to an emergency landing in the Hudson River last month. Sullenberger, Skiles and veteran flight attendants Sheila Dail, Doreen Welsh and Donna Dent spoke to CNN's Larry King on Tuesday. The captain and his crew have achieved national fame since their January 15 landing, in which all 155 passengers survived. "My sleep has been disrupted ever since the incident ... It's distracting and it's hard sometimes to turn off my brain at night," Sullenberger said. Sullenberger's crew members expressed similar experiences in the aftermath of the incident. All but Welsh, a 38-year veteran who was injured in the accident, said they felt certain they would return to work at some point. Passengers meet Captain "Sully" Sullenberger and crew to say thanks for saving their lives. Earlier this month, the National Transportation Safety Board said both the plane's engines contained the remains of birds, confirming the pilots' report that the engines shut down after colliding with birds less than 2 minutes after taking off. The plane's flight data recorder "revealed no anomalies or malfunctions in either engine up to the point where the captain reported a bird strike, after which there was an uncommanded loss of thrust in both engines," the NTSB said. Sullenberger took over the controls from Skiles, who had been piloting the plane, and Skiles tried to restart the engines. Within minutes, Sullenberger decided to land the plane on the Hudson. The crew praised the passengers remaining remarkably calm throughout the ordeal. "It was incredible," said Dent, a flight attendant with 26 years of experience. "They did very well, a very educated group of travelers. I think that helped a lot. We had a lot of frequent fliers."